As you can see, I’m ready for spring, so ready that I made this almost florescently green soup and ate it cold. 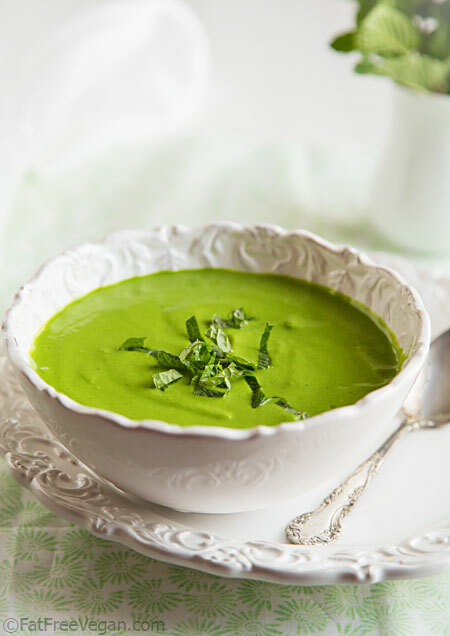 If it’s possible to will a spring into springing by eating springtime foods, this minty soup should do the trick. With sweet green peas and fragrant mint, it just tastes like spring. I think it’s the greenest thing I’ve ever cooked, certainly more vibrant than my previous green champion, Green on Green Soup. And it’s also probably my easiest soup. I just threw everything into the VitaMix, not even bothering to defrost the package of frozen peas first. The serving sizes I used to figure the nutritional stats below are small, appetizer portions, but I’m going to level with you: I ate two servings followed by an apple and called it lunch. I thought I’d still be hungry, but this simple soup somehow manages to be both refreshing and satisfying at the same time. 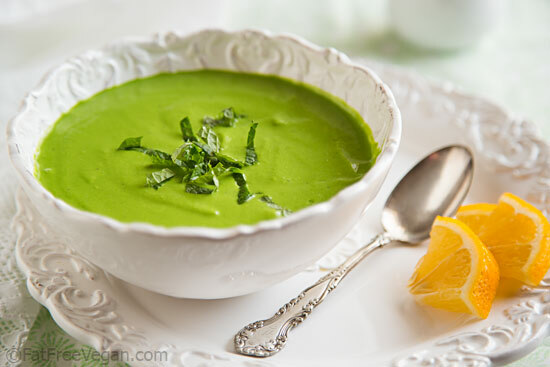 So eat your green soup and help me convince the weather gods that spring is here. I’m ready for open windows and affordable organic strawberries and asparagus! If you don’t have a high-powered blender, I recommend using avocado rather than cashews. See the Variations below for nutritional details. Place the water, cashews or avocado, and garlic into blender and blend at the highest speed until completely smooth. Add the peas, spinach, lemon juice, and mint and blend at high speed, using a pusher if your blender has one, until thick and smooth. Taste and add freshly ground black pepper, salt, and additional lemon juice, if needed. Serve cold, with lemon to squeeze into individual servings. I like this soup cold, but it could easily be served hot. Start with defrosted peas, make the soup as directed, and then warm it gently on the stove or in the microwave until it’s the desired temperature. Also, if you have a VitaMix, you can heat it by allowing the blender to run on high for an extra 2 or 3 minutes. The cashews give this soup richness and depth of flavor, but if you want to reduce the fat, use avocado instead and subtract 25 calories and 2 grams of fat from the nutritional figures below. If you can’t have any fat, you can leave out both cashews and avocado and subtract 3 grams of fat and 39 calories, but the results won’t be as delicious. This is gorgeous, and I don’t doubt it’sdelicious too! I’m with you–bring on the asparagus and the open windows. (I’m sitting here writing this in my jacket and rain pants, ready to head out into the March elements up north.) I will look forward to making a version of this when my mint is leafing out!! Thank you, and Happy Spring!! Which VitaMix blender do you use? There are so many choices and its so confusing to choose. Thanks. This looks really nice and easy. Yum! I didn’t think frozen peas were raw… Are they? They’ve probably been blanched, so technically they may not be completely raw. Of course, you could use 12 ounces of fresh peas to make this, making it truly raw. I think I will be trying this warm until spring arrives. It should be here. Last year at this time it was sunny and warm, this year we have snow. I’ve not been brave enough to leave my vitamix running this long. I know it has a strong motor, but I am still nervous about it. I love my vitamix. Best gadget ever! Eating this for lunch right now! I put the water, avocado, and garlic clove in the Vitamix before going to the freezer and realizing I had only 5 oz of peas! Figuring that was close enough to half of what I needed, I poured out half the water, cut the garlic clove in half, and removed some of the already mushed up avocado, then halved the rest of the ingredients. I’m not really a fan of cold soups, so I let the Vitamix run awhile to heat it slightly. Quite delicious! My three year old won’t try it, but that just means more for me! I’ll try it again when I have the right amount of peas and probably like it even more. I have to admit, the thought of the mint threw me at first, but I love raw peas…so…I do believe I want to try this soup–mint and all. I will have to pick up some mint and avocado this weekend. Thanks for posting. Secondly, I recently learned that it can be unsafe to not cook frozen veggies before using them. See this for more info. Thanks for that link, Holly. I had never heard that! I have to say that it doesn’t bother me in regards to frozen peas because unlike frozen greens, they require such a short cooking time that the difference between them cooked and straight out of the bag is minimal. But to be completely safe, I suggest cooking them for just a couple of minutes before blending. That won’t affect the flavor of the soup. This recipe looks delicious as well as very healthy and I would love to try it. However, I can’t eat mint; I have reflux and it irritates my esophagus. I s there another herb or spice that might be suitable instead? I think this would be delicious with basil or thyme, but really, any herb that you like should go well with these subtle flavors. This sounds delish, Susan! Spring has definitely sprung, here in the Phx area. It is too hot to have the windows open the afternoon already and I have been collecting sunburns out in the garden! 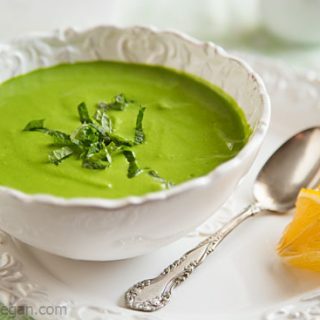 Cold green soup would be the perfect way to cool off afterward! Incidentally, my mint is still scrawny, do you think cilantro would be a passable substitute? PS-that’s scary stuff about the raw, frozen greens! We will all have to be careful about that! I made this today and it was great! I used an avocado instead of cashews. If you’re using a regular blender – not a fancy Vitamix – I’d recommend defrosting the peas in the microwave for a minute. Thank you! Green for spring! It’s actually a recipe quite similar to a dip a make almost every weeks, I just don’t add water and I put some silken tofu to make more nutritious and creamy. It’s awesome with raw beets crakers! I made this pea soup tonight and I love it! I made it with frozen (uncooked, with no plans to in the future either) peas, avocado, and a 400 watt blender. I had mint on hand and that is what drew me to this recipe. I was quite skeptical about the peas, I think I still have bad memories from canned peas. But, I was so pleasantly surprised at how fresh this tastes! I froze the leftovers right away to keep the bright color. My husband and I ate it with whole wheat baguette. Just made this, and while it’s divine, my stomach swelled after just a few sips. I’m vegetarian and eat all of the components (except for mint) often. I’m wondering if it’s a fluke or if you think something about a raw soup startled my digestion? I made this soup with the cashews as you recommended and I found it quite bland until I added the freshly squeezed lemon. What a difference the lemon made! any suggestions if one uses dried peas? A family member is allergic to both cashews and avocado (all stone fruit, incidentally.) What substitute would you recommend? Would macadamia nuts or Brazil nuts be close? I just made this soup. It was exactly what I was hungry for! Tastes so fresh and so delish! Susan, you are my go-to for pretty much everything I cook and eat. Thanks for all your great recipes! I found this recipe while searching for ideas for what to do with this week’s haul from my CSA. I used a whole pound of raw spinach (removed the stems and saved them for stock), a whole avocado, 12 ounces of frozen peas and about 8 ounces of shelled edamame, extra mint and lemon juice. The result was a thick, creamy, sweet and savory, healthy soup! And it was so easy to make in the Vitamix. Thank you so much for this recipe! Two weeks ago I bought some fresh frozen peas and planned on making this soup and then my blender died! After years of pining I finally took the plunge. I just got my Vitamix today and this is the very first thing I made. It was absolutely delicious!! Pea soup! Thank you for this recipe. I like the addition of spinach! I make this soup with broccoli and it’s wonderful. When I saw how quick this is to make I really needed this to be great…and it is! Just made it. Yum! hello, how many days can this keep in the fridge? It tastes best fresh so I wouldn’t keep it more than 2 or 3 days.